“The cosmos (The cosmos is the universe regarded as a complex and orderly system; the opposite of chaos.) now enters intergalactic space (Intergalactic space is the physical space between galaxies.) to allow a more fluid receiving of planet earth. This receiving is meant to help all on earth coalesce with the greater realities of Oneness, of Truth and Light. This seeding now occurs as all on earth adjust to the new frequencies, new energies, brought about by waves of consciousness. These waves have entered your atmosphere compliments of your sun. The great central sun continues to spew forth these greater realities, for humanity must not tarry in the midst of darkness for it is time to awaken to the trueness of Self. 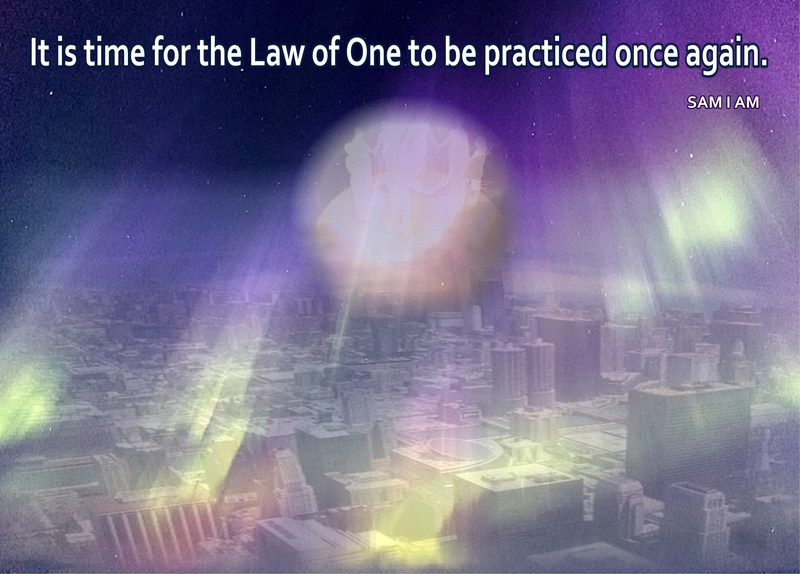 “All on earth are ready to accept this process or they would not be on earth at this time. This process is one of greater Love and Light for humanity has now passed the point of no return to darkness. The greater realities before planet earth now seed the planet with the Truth of original BEingness, but before planet earth reaches that point in its time/space continuum it must accept its extra-terrestrial original origins. 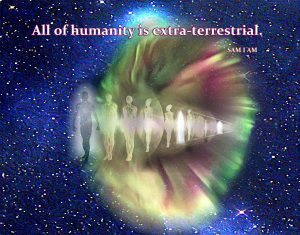 All of humanity is extra-terrestrial. Nothing on your earth was there before what many refer to as the big bang. All life came from intergalactic space. Your cosmos is one of many moving through this process, but your particular cosmos is the only one that hosts the human form and therefore is of specific/particular attention to those unseen realms surrounding all space and time. “These waves moving though and approaching your planet continue to create greater possibilities of awareness, of true BEingness. This is one of the nine events. The waves coming into the consciousness are one of these nine events. And as these events occur, humanity awakens on an even greater scale than ever before. “The next great event now moves through the consciousness of humanity as these waves cement greater realities. The second event is more of human nature, for it is a change in systems of government. These systems shall now include intergalactic communication, intergalactic awareness, and open partnering with intergalactic beings now widely known throughout your earth. This meaning the people of earth shall now become aware of the partnering of intergalactics within your government. This is the second event. “The third event moves forth through the awakening of consciousness for humanity as well. This third event concerns the financial aspects of your planet. These financial aspects will now be more open and fluid for all humans, for no one being or one group will be able to secure financial success without other human beings afforded the same pleasure. “The fourth event upon your planet earth is one of more open Oneness among the people of planet earth. Each human will become more aware of its oneness with others. Each human will become more aware that it is not on its own island of awareness but is also part of the humanity in which it finds itself. Each human will now seek to move within this sea of consciousness to help others, to help other humans within this oneness of the New Reality of BEingness. The BEingness humanity moves toward is a BEingness without form, a BEingness that many entities now enjoy after having experienced form, in other places, in other spaces and times of your illusion, the channel’s illusion, the illusion of all those who now read or hear this message. “The fifth event for humanity is of catastrophic nature to earth. These necessary earth changes help to bring in these greater realities, the seeding of your earth. This seeding of your earth occurs through these so-called catastrophic events. “The sixth event within the planet earth is one of a great awareness of ones own power as co-creator, the co-creator in earthy form, now changing. “The seventh event within your earth is this change of physical form. This physical form now coalesces to be more in tune with that formless being, that ethereal formless being that inhabited planet earth in the beginning of time and space. This whole BEingness shall not take place for quite some time. It is not necessary to report this timeline for it will not occur in the timeline of any human that is now in form. “We give you this eighth event now with great anticipation knowing that all are aware of the possibility, the return to the Lemurian aspects of humanity, no longer in form as it is now, but in the ethereal BEingness achieved upon proceeding this planet in the new space and time. “The ninth event occurs after this eighth event of awareness of the ethereal form. It is the return to the BEingness for all Truths, all Light. Space and time disappears into the illusion of where it was created and henceforth, all return to the BEingness of Oneness, of Light, of Truth that it has never left. “We congratulate all of humanity who now graduates towards this awareness. And we are grateful knowing that more aspects of the True Reality of BEingness now know and live the Truth of Oneness. Support those who support you. It is as simple as that. Experiences of good often increase when we concentrate on inspirational thoughts. Comments, questions and suggestions welcome at the Contact Page.~Support your Self by purchasing an inspiring bedside companion. Introducing Book Of One 🙂 Lightworker’s Log Volume 4!~Visit SAM I AM Productions to support your Self and the author by purchasing books there and not through greedy corporations. Loving You! “It is time to speak your truth, Gatekeepers, Gridkeepers, your specific actions help to cement the crystalline grid. Your earth changes rapidly as all unseen realms watch from afar, distant galaxies, distant planets, and yet, distance is only a state of mind. 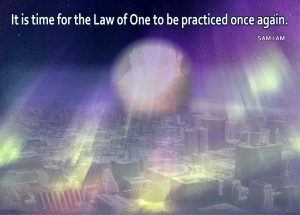 It is time to speak the truth of the Law of One. 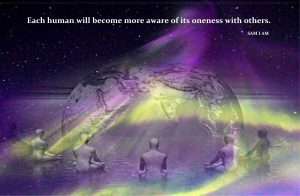 In coming days, all shall become more aware of this Oneness as your world yet again experiences mass confusion, mass chaos. This is yet another new beginning for humanity and Mother Earth. In my mind, I ask for a source to name, even knowing it is all illusion and every message comes from my own consciousness. If I must name a source for this message, I hear, make it Amanda. Experiences of good often increase when we concentrate on inspirational thoughts. Find more channeled messages in Book of One 🙂 Volume 3 , Book of One 🙂 Volume 2, and “Book of One 🙂 Volume 1″ available through New Leaf Distributing, OR visit SAM I AM Productions to support the author by purchasing books there and not through greedy corporations. Loving You!